After a long sleep in my beautiful hotel bed, I felt so amazing when I woke. My body was stiff and sore but it didn’t matter, I had made it, I was there. The breakfast in the hotel was AMAZING. I felt like a princess enjoying the delicious, quality food. I caught up with Dave and we went and handed in our passport to receive our certificate. What a cool feeling. 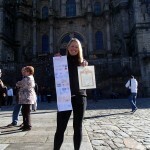 It was awesome running into other pilgrims around the Praza Do Obradoiro, Albert, Ann and Jess were just a few we met. It was the most amazing experience walking through the Cathedral. I felt so funny inside, very emotional. We all joined in the 12pm pilgrim mass and the priest read out the countries from where the pilgrims who’d finished had come. It was exciting to hear Australia mentioned as I was the only pilgrim that finished from my home country today. We were so grateful as the enormous 80kg botafumeiro (incense burner) swung from side to side filling the cathedral with a beautiful aroma. There was so much energy, absolutely amazing. People from all over the world visit the cathedral to experience this sensation. The cathedral’s history was overwhelming. In the centre was the Throne of Jesus and St James surrounded by the twenty-four elders of the Apocalypse and a pantheon of Apostles, Angels and Saints. Unfortunately the famous kneeling statue known as Santo Dos Croques was closed to the public. Traditionally, pilgrims touched it three times with their heads hoping that some part of his genius would rub off on them. I searched around for the Post Office as I wanted to check that my bag, which I had sent ahead of me at the start of my walk, had reached its destination safely. I showed my passport for ID, it was all that I had, and with great relief they handed me my bag. I said “great” and convinced the post office worker to keep my bag for another four days so I could continue to Finisterre. Although he didn’t understand at first we finally came to an understanding. I was really looking forward to wearing my pretty, clean clothes on my return. I caught up with Sandor for a wine afterwards. He was sweet but the language barrier was still there and I just didn’t have the patience to try to communicate with him. So I said my goodbyes and off I went. I felt grateful to have met him and for his gift of showing me that there are beautiful, kind men out there who are happy to give and be kind without expecting anything in return. I continued looking around the city and enjoyed eating Churros alone. It was nice just to sit in a cafe and watch the people passing by. Later that day we all lined up eager to receive the FREE dinner that the Hotel Hostal Dos Reis Catolicocs gives away each evening to the first 10 pilgrims who line up at the back door. We were winners! It was so cool to enjoy a huge, delicious meal at a five star restaurant… so so yummy. We all indulged and savoured every mouthful. We enjoyed the wine at a bar and tried a delicious chocolate yoghurt, yummo! I came to the decision to walk to Finisterre and possibly Muxia with Dave and Jess. The plan was to leave by 9am. It seemed crazy not to walk the extra 100km after having already come so far – 796km! I felt I had more in me. I knew deep in my heart that I was not finished yet. I decided to stay solo in the hotel again to enjoy some ME time. I appreciated the timeout on my own more than I ever had before. The feeling of accomplishment was huge. I was excited about wearing my nice clothes again but at the same time didn’t feel attached to them. I didn’t care too much about it at all. I feel excited about future opportunities to achieve more. If there is opportunity to do more then I feel drawn to challenge myself. I have a strong desire to give my everything in all that I do. I almost felt incomplete. I knew I had more in me and that my journey wasn’t finished. The pleasure of achieving my goal outweighed the pain from the walk. Copyright MAB © 2013-2015. All Rights Reserved.